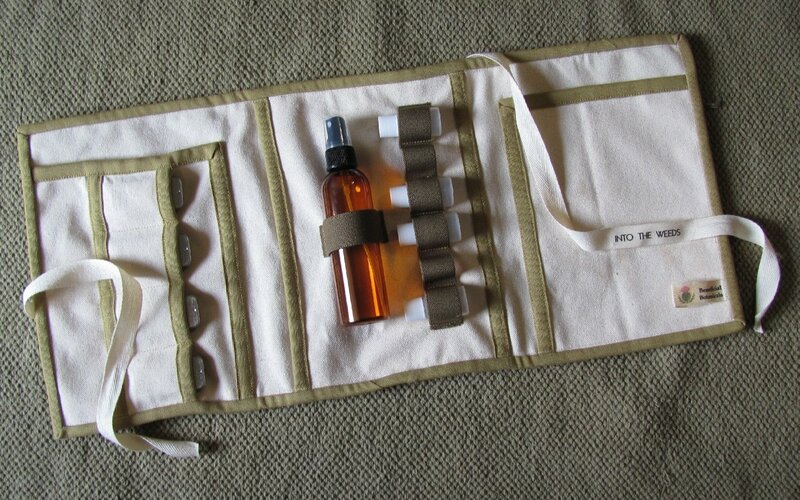 Put together a personalized kit combination with this kit cover for herbal first aid, cosmetics, art or sewing supplies to take on your next hike or outing. In any case, we've got you covered! Now you can buy the Into the Weeds Kit Cover, without the products. It's a super organizer for other things too. This kit cover has 2 large vertical pockets, 1 large side pocket (in the middle panel), 4 side slots, 1 slender side pocket , and 7 elastic hold downs. Twill ribbon closure ties it into a neat pack. Made from durable 100% cotton canvas with military weight elastic. Machine washable. Lay out to air dry. Empty containers are not included but may be purchased separately. Three Panels Folded & Tied is 7" x 10" x 1" to 1-1/2"
Three Panels Opened is 21" x 10"